Virtual Spanish Wine and Food Pairing Request: What are your suggestions? We like loyal readers, but we love readers who send emails, leave comments or give us virtual shout-outs even more! So when CJ and his wife, Edna, contacted us with a intriguing request, we jumped at the opportunity to not only respond to it, but also to share it with you in a virtual wine pairing challenge! Every month, their country clubs asks a member(s) to host a food and wine pairing; and come April, it will be CJ’s and Edna’s turn. Being that they love Spain, they’ve gathered a nice selection of Iberian wines to be paired with some delicious recipes. The question being, which recipes pair well with these wines? The chosen wines are listed below, followed by a series of suggestions on our part as to what Spanish foods should be paired with the wines. Our hope is that by exploring possibilities, as opposed to dictating “exact answers”, we can create a community driven menu. But this will only work if you include your suggestions. Simply write them in the comments below; and if you have a recipe ,or just a fun experience with a wine or regions wines, let CJ and Edna know about it! Please don’t hold back!Â Hopefully together, we can put together a killer menu for CJ and Edna’s dinner party! So with out further ado, here are the wines, and our first thoughts as to what we would like to eat with them! Anyone who reads Catavino is intimately familiar with our adoration of Cava, believing that it is the primer wine to pair with food. Zesty acidity and vivacious little bubbles allow this wine to marry perfectly with any dish. That said, as this specific menu begins with Cava, we feel some finger food is in order. 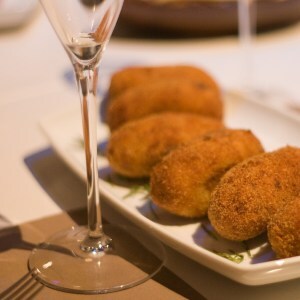 As Catavino is regionally based in Catalonia, and the Cava is a rosé, why not Croquettas de Jamon or grilled prawns? The wine can easily cut through the rich flavors, leaving your palate cleansed and ready for more. Fresh vibrant Albariño, oh how we love thee. Considering the line up of wines we have ahead, we think this is the perfect moment to insert seafood or light vegetarian fare. Fresh raw oysters may be one option, or a personal favorite of late, scallop sashimi with a splash of citrus, both native to Galicia. On the veggie side maybe it could be a simple vegetable terrine with layers of red peppers, eggplant, zucchini, and carrots and maybe a touch of basil to liven it up. Think simple and chilled. Mencia from Bierzo, are wines with backbone and bite. Mencia is a great pairing for charred flavors, though we prefer to save this pairing for later. Therefore, why not pull out the good Jamon Iberico? You could easily sneak in a plate of Jamon with a rich Manchego cheese and find a very happy crowd nibbling away. Unconventional? Cheese before the meal, but there’s a lot of fruit in this wine with a considerable amount of rich spiciness. Assuming you find the right cheese, it might offer a nice respite before the big meat guns come out. Rioja, oh how you call out for lamb. Although most meals would end in lamb, this is a tasting menu with possibly just a bite during each round. Consequently, two perfectly shaped lamb “chulletillas”, lightly charred, with a dusting of flor de sel would be a delicious and simple way to go with an emblematic Rioja such as this. Maybe end with a fine sliver of red pimento to color the plate and acknowledge the world is made up of more than meat. We’re coming into the home stretch, slowly sliding into the final courses when we meet a mini-monster at the final turn. Priorat is known for its big wines, and after lamb, we might need to try something completely different and innovative so as not to interrupt the flow. Being that we moved from Rioja to Catalunya, why not a plate of habitas con calamares? Small baby fava beans cooked in a stew with equally tiny calamares; rich, decadent and something that no one will expect. You may ask how thisÂ big red can be paired with seafood? Visit the Priorat and you’ll quickly find that this is not a delusional wish of mine, but an everyday reality for many. Oh and the Carignan heavy wine with its rich acidity does the trick quite well when served up during the Menu del Dia. Finally, we encounter a wine from the heart of Spain, if not Iberia itself. The Ribera del Duero [river] fuels so much of what makes Spain and Portugal what it is today; and thus, its wines must be paired with the food that is equally at the heart, or should we say belly, of the Iberian culinary tradition; pig. Without the porcine influence that we know and love, Spain would not be what it is today. And a wine like Flor de Pingus who is the baby brother to the legendary Pingus itself, must end the meal with a slice of suckling pig. Visit Ribera del Duero and find a restauarant where this is not served with the region’s wines, and you’ll know that your GPS has failed you. Crispy skin with rich milk fat laden meat, there is not a better pairing in our book, but then again, my book of Spain begins with a snout and ends in a curly tail. We hope some of these ideas are interesting. 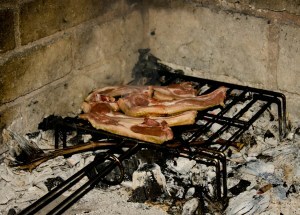 The key with Spanish foods are in the ingredients, not necessarily the preparation, other than to say “less is more”. We were once was told the recipe for suckling lamb was to take a lamb, place it in a cazuela (shallow ceramic pot), sprinkle it with some olive oil, sea salt and then throw it into an oven for a nice sunburn. Each dish mentioned, save for the Croquettas, should have a fine Spanish olive oil. If you can get your hands on Arbequina olive oil, I would liberally sprinkled on top. Now, what do you suggest? What would you do? Maybe we should rearrange the wines a bit? Spill the beans on what you think we should do!! I know we’re starting to get hungry!